Great apps are even better when they’re on sale! We’ve selected 64 iPhone and iPad apps that are over 30% off. 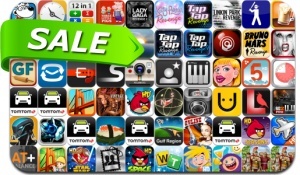 This app deal alert includes Angry Birds Space / Seasons / Star Wars, Cytus, Word Trick, Bridge Constructor Playground, Flight Control, Roads of Rome, Bridge Constructor, Bang, Epoch, Tap Tap Revenge Apps, InstaMail, WolframAlpha, TomTom Apps and many others.